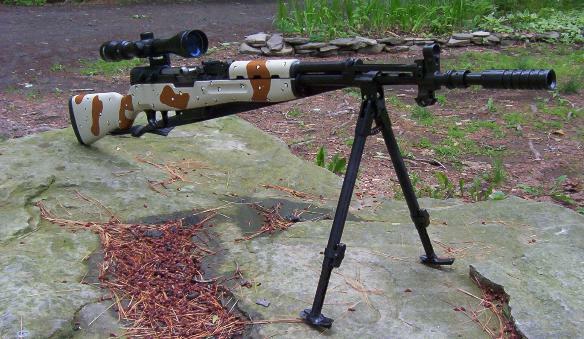 Here are some pictures of my SKS rifle. The SKS is a semi-automatic rifle used in the armys of many countries including Russia, Vietnam, Albania, China, and many more. Mine is Yugoslavian made. It's one of the better quality examples. Milled trigger guard, milled receiver, just a nice quality piece. It is 7.62 x 39 caliber; it has an integral grenade launcher, that's what that thing is on the front that looks like a silencer. The gun comes with a 10-round fixed magazine and a wooden stock with blade-bayonet. I completely overhauled this rifle recently and took the photos shown below. I custom painted the Desert Storm stock, which started it's life as a plastic red chinese piece. 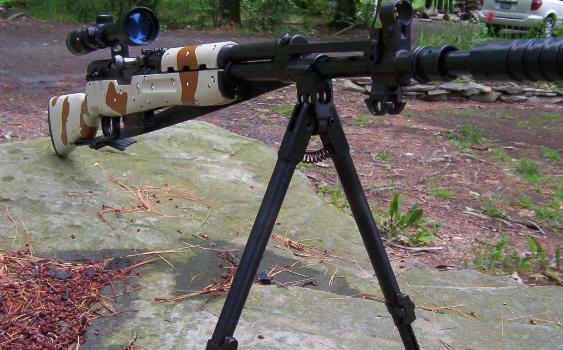 I added an original factory bipod, and a 3-9 power scope on a mount made by Leapers. In the picture it has a detachable 5-round magazine, but i also have a detachable 30-round magazine as well. 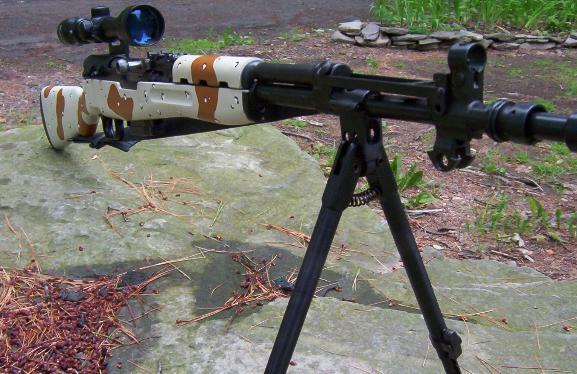 When sniping with a bipod you shouldn't need any more than 5 rounds anyway. It looks pretty badass now!